Bianca who is a pretty girl has produced some very striking kittens. She will be mated to Byron this season. Ms Bianca will have a repeat mating to Damukyan Fhoenix this Season. Ms Gisette a lovely Blue girl from last Season’s mating has settled into her new home in Belgium. A beautiful Blue Point girl out of DB GD CH Zarlee Tsa Niki and DB GD CH Damukyan Ms Zelda. Celine will have her first mating this season, a stud yet to be decided upon. Ms Celine will be mated to Fhoenix. 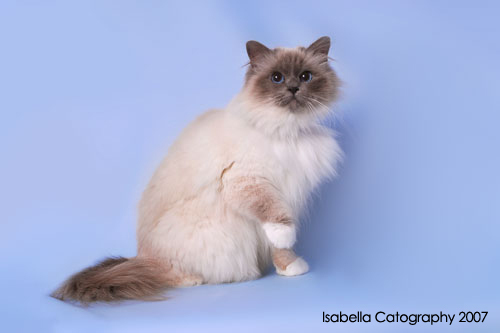 Celeste is a gorgeous Seal Point girl. 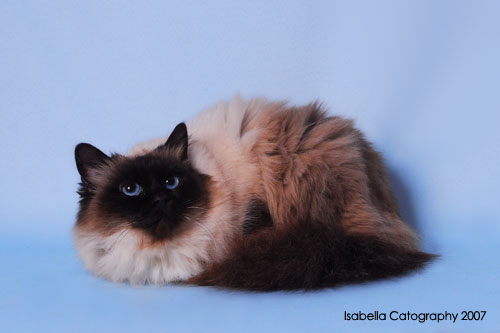 Last season Celeste produced Enya, a beautiful Chocolate Point girl who is staying at Damukyan. Celeste has had a repeat mating to Tshinta Choclat Oracle. Ms Celeste will be mated to Byron. Della is a lovely Lilac Point girl. She is a progeny of Byron and Bianca. 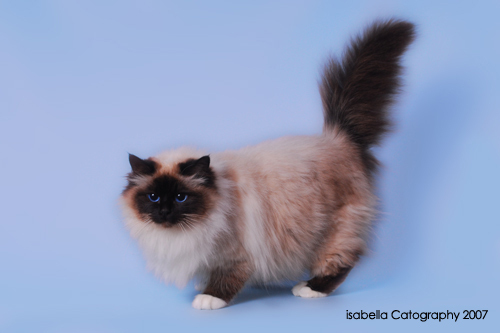 Last season Della produced Eloise, a gorgeous Seal Point girl who is staying at Damukyan. Ms Della will be mated to Fhoenix. 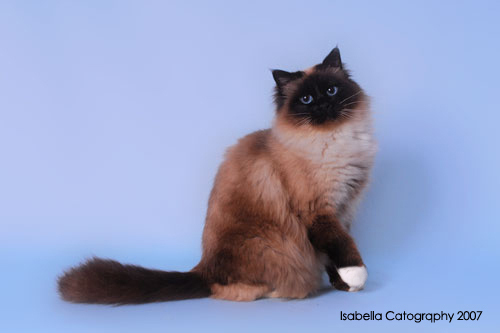 Enya is a gorgeous Chocolate Point girl, sired by Tshinta Choclat Oracle and Damukyan Ms Celeste. 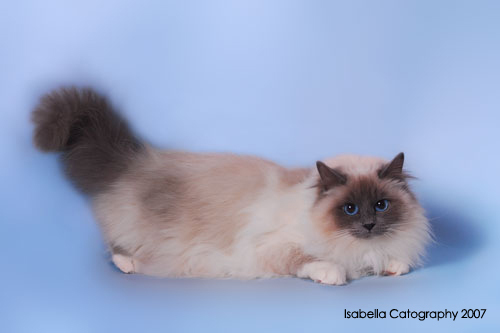 Enya has excellent Chocolate Point markings and beautiful coat texture. Enya is enjoying her show career to date. Ms Enya will be mated to Byron. 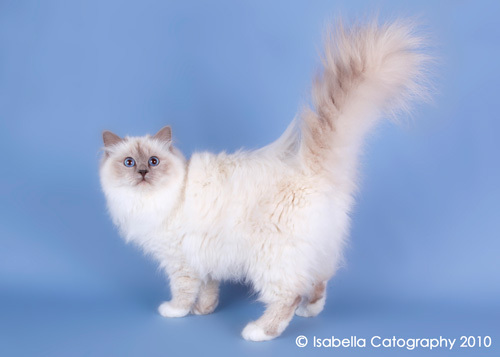 Eloise is a lovely Seal Point girl sired by SV.DB.GD.CH. Zarlee Golden Takashi and GD.CH. Damukyan Ms Della. Eloise has a wonderful personality and fun loving nature. She adores everyone. Ms Eloise will be mated to Fhoenix. 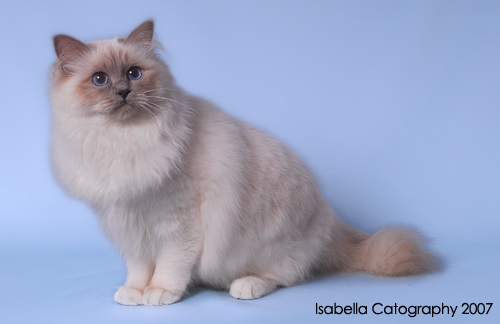 GiGi is a beautiful Lilac girl sired by Kasario Rusticana (Imp.NZ) and Damukyan Ms Elolise. 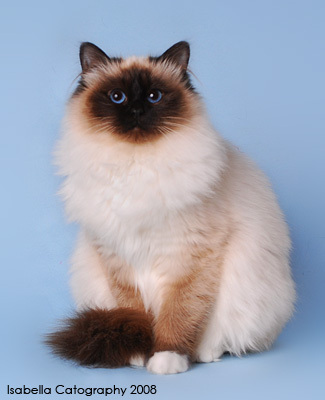 At Sydney Royal Kitten Carnival Ms GiGi won Group 1 Reserve Best Female Kitten and Group 1 Best Kitten Bred by Exhibitor. Cassie is now retired. Cassie, with excellent Zarlee and Tshinta lines behind her has been a consistent breeder of some very nice kittens. Dharma was originally given to my eldest son David,but when he was transferred to Thailand, Dharma came back ‘home’ – she is a granddaughter of BZ DB GD CH. Namrib English Rose (Imp.UK). 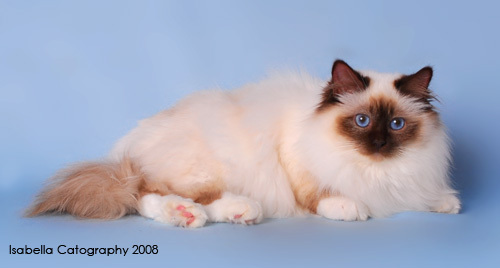 Dharma has exquisite Seal Point markings and has produced some beautiful kittens for Damukyan.